Really hope you had a lovely Thanksgiving today, if you celebrated. Mine? It was challenging. One of my boys takes after his Daddy and doesn't like large gatherings or loud noises. Even though we explained what the day was going to be like, once we got to my cousins and he took a look about, heard the noise...he burst into tears. CRIED AND CRIED. Oh man. This hungry Mama tried everything. Finally my husband brought him to the car to calm down and I got to have a little something to eat. He eventually came back and felt much better. His twin brother had a blast and all of my boys are sound asleep now :) I love my family and am thankful for each and every one of em! I wanted to wow the crowd with some fancy nail art...but uh...I ran out of time this morning. I just did a super fast 3 coats of SpaRitual Conduit, topped with HK Girl. 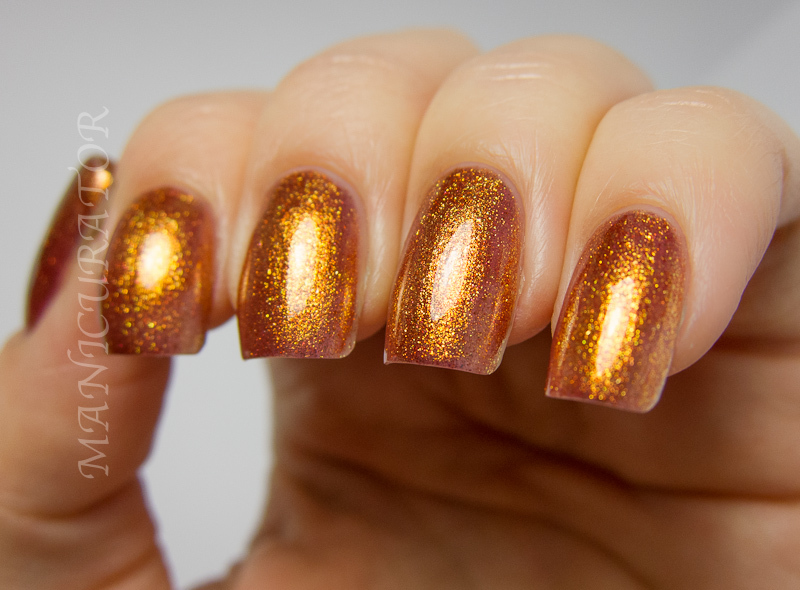 Conduit is part of the Gold collection released in Summer 2012 and is so stinkin pretty!! 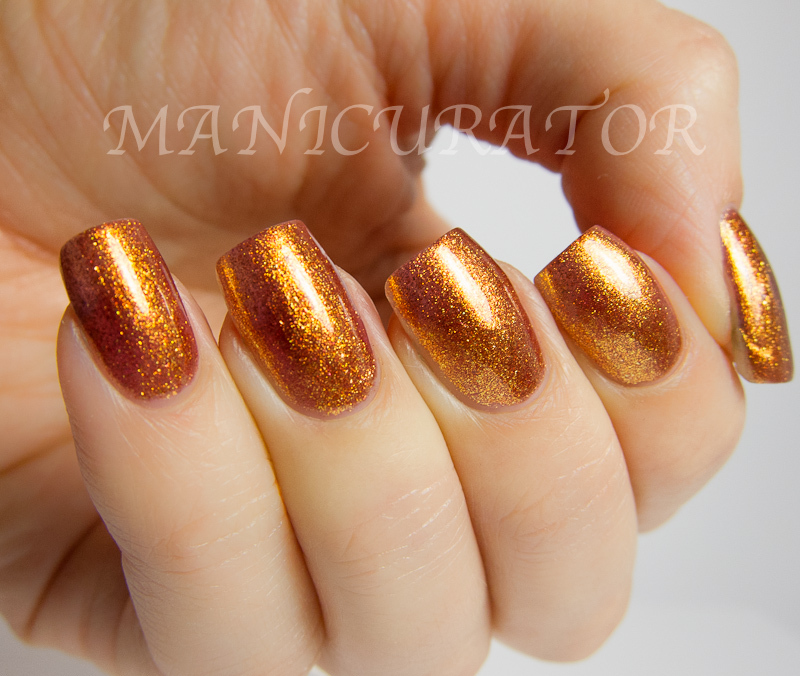 A copper gold shimmer. Take a look! I love this to pieces and felt like it was the perfect choice for this holiday! Do you agree? What was on your nails today? Do you like to match your nails to the holiday? I wasn't wearing anything special, no Thanksgiving where I come from (Switzerland). But I do match my nails to the holiday, Christmas nails, New Years Eve nails, national holiday nails etc. Stunning colour! and so appropriate for the holidays! I do match my nails to special events also. This is such a gorgeous polish! Perfect for Thanksgiving! I like to do some nail art for holidays, so I did some simple turkey feathers. I'm really looking forward to Christmas nail art! This is gorg! Wow! 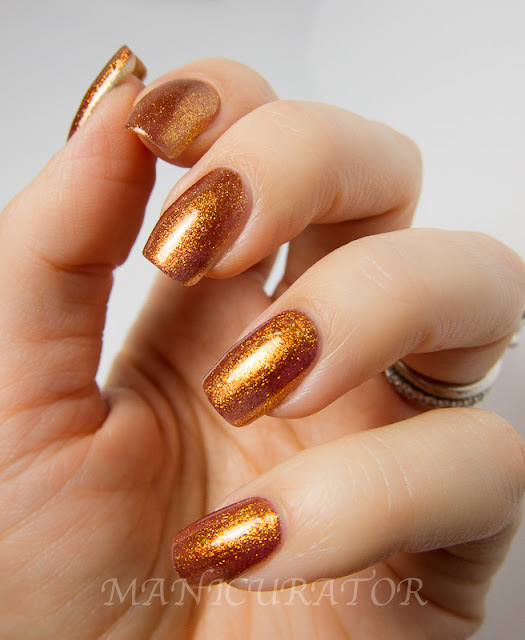 I did not pick this up when SpaRitual had this collection going - I was not that into gold polish until seems after Zoya released Ziv this holiday and shortly before that, I started to wear my yellow gold again. I had noticed finally the finishes on purses and belts were going back to yellow gold from the silver they have been for soooo long!